Intense, unconventional and a very good read. Rod Reynolds makes a fine crime fiction debut with ‘The Dark Inside’, and he does so by taking several authorial risks, all of which pay off, yielding a gripping plot with a difference. The biggest risk, to the most satisfying outcome, Reynolds takes with the main protagonist. Charlie Yates is neither a cop nor a private investigator, he’s a crime journalist. Hacks (to use Reynold’s own label) aren’t usually well-loved and are rarely appreciated as and by crime fiction characters, whether law-enforcement officers, victims or criminals. But you can’t help liking Charlie Yates. A young man who’s taken a few punches in life, enough to make him taste bitter failure, but still earnest enough to believe in what he does. He’s resourceful and dogged, as any good reporter should be, and though beset by something of an anger-management problem, he’s fundamentally honest and honourable. He’s well cast as a sleuthing reporter sent to investigate a series of assaults and murders of young couples, perhaps slightly less so as an action hero capable of taking on a large cast of nasty villains. But he’s an engaging character who fits well with Reynold’s tight plotting. 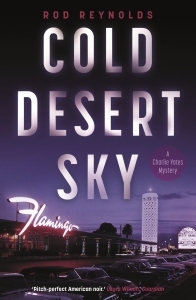 Apart from Charlie’s occasional bouts of self-deprecation, Reynolds keeps the reader firmly focused on the investigation, with very little in the way of diversions or sub-plots. This lends the story an intensity almost akin to a Maigret novel, keeping the reader riveted even when the plot is in danger of falling a little flat. Another risk Reynolds takes is with time and place, and again he handles both very well. From New York where he plies his trade, Yates is sent to investigate serial crimes against courting couples in rural Texarkana, a small town on the border between Texas and Arkansas. It’s retribution for some of his recent antics at work, potentially a prelude to being laid off by his editor. The location, a remote, gossip-permeated country town, is isolated enough so that the local bigwigs and coppers can act as a law unto themselves. It’s a great setting for a claustrophobic tale, the sequence of horrific crimes making the tension escalate in a pressure-cooker environment. The novel is set in 1946, and Reynolds works well to give the narrative a period feel while keeping the story flowing, without burdening readers with obsessive historical details. He occasionally seems to overplay some of the characters’ hick speak, but he’s very convincing in portraying the mores and attitudes of a small community in the immediate aftermath of World War 2. 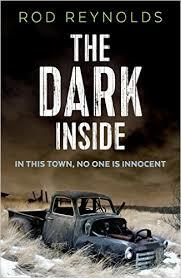 Above all, the crime plot of ‘The Dark Inside’ is very good: layered, believable and teeming with well-delivered twists. It focuses single-mindedly on Charlie Yates’s investigation, and becomes more and more intense as his involvement with one of the victims’ relatives plunges him into a web of local intrigue. It’s near impossible for Yates to know whom he should trust: the overbearing county Sheriff, the local industrial tycoon with ties to the US military, the victims themselves, some of whom turn out to harbour disturbing secrets. The reader too is kept guessing about each of the main characters’ motives, until the very end. Given the cloistered nature of the novel’s location, this is one of Reynold’s finest achievements in this satisfying debut novel, making for a truly explosive finale. When Charlie Yates will be ready for another assignment, we’ll certainly want to read about it!